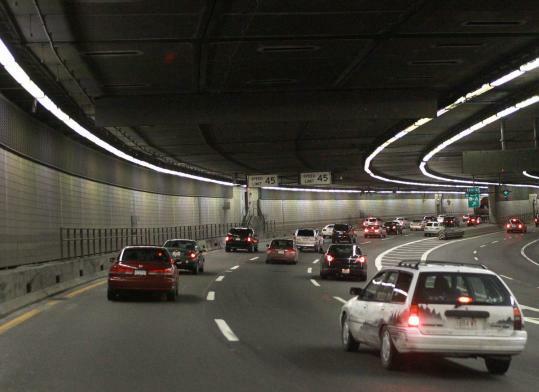 Constant water leaks into the Big Dig tunnels are causing safety problems and tens of millions of dollars in damage, including corroded electrical systems and flooded air vents, and have even begun to damage the enormous steel girders that support the Tip O’Neill Tunnel, according to an internal report by the Big Dig’s chief engineer obtained by the Globe. But the April report, intended to brief a new top deputy to Transportation Secretary Jeffrey B. Mullan, was extensively rewritten at transportation headquarters, where staff reduced the seven-page report by two-thirds. The shortened report covered most of Helmut Ernst’s major points, but left out much of the detail on the present and future cost of repairs and omitted some specific warnings by Ernst about the potential threat of the ongoing leaks to the safety and long-term structural integrity of the tunnels. Ernst’s report does not say the tunnels are unsafe, but voices more alarm at the potential risks of the leaks. The report was written after a corroded 110-pound light fixture crashed Feb. 8 in the O’Neill Tunnel, revealing widespread corrosion in lights throughout the 7.5-mile Big Dig tunnel system. Ernst’s report makes it clear that the fallen light is part of a much larger problem: the salty ground water that seeps in through cracks and other openings in the tunnels. “Tunnel leaks are a more vexing problem as they are widespread throughout the tunnel and are the cause of safety concerns and [have] a damaging effect on the tunnel structure and equipment,’’ wrote Ernst. Ernst listed more than $150 million in immediate leak repair and prevention projects and stressed that potentially more-costly leak repairs lie ahead, including extensive excavation to repair major cracks in one tunnel. He has previously said that replacing and rewiring corroded tunnel lights could cost $200 million. In the aftermath of the fallen tunnel light, Mullan first reprimanded and then suspended Ernst for his role in failing to notify the public for more than a month after the light fixture collapsed onto the highway. The suspension was announced on the same day that DePaola reassured the board that the water leaks are not a major problem. DePaola’s predecessor as highway administrator, Frank Tramontozzi, who was forced to resign in March for his role in mishandling the light fixture collapse, said Ernst’s report is quite accurate. “Wow, that’s telling it like it is,’’ said Tramontozzi. DePaola insists that he only shortened Ernst’s report to make it clearer and less technical, not because he disagreed with Ernst’s points. And the rewritten report does make most of the points found in Ernst’s, though in generally softer terms. “It was a little rambling and long, and I had the staff of the environmental office turn it into two pages,’’ DePaola explained in an interview. DePaola’s handling of Ernst’s report seems at odds with the transportation secretary’s public avowal of openness and opposition to the “culture of secrecy’’ that some say conceals problems in one of the most expensive sections of highways in the world. In fact, Mullan’s office only provided a copy of the document to the Globe after months of requests to provide any reports on the tunnel leak issue as required under the state’s public-records law. Ironically, it was Ernst’s failure to put safety problems in writing that led to his suspension. Ernst’s team of engineers filed no written report about the collapsed light fixtures despite state policy requiring documentation of safety issues. Ernst admitted that his engineers have been wary about writing things down since the 2006 collapse of a Big Dig ceiling panel that killed a woman. “After all the depositions in the ceiling collapse case, we just meet and talk about it. . . . What’s the point of putting it in writing?’’ Ernst said in an interview this month. But as soon as DePaola replaced Tramontozzi as highway administrator, DePaola said he asked Ernst to prepare a report on water leaks in the tunnels, an issue that came into public view in 2004 when the gushing water forced temporary closure of Interstate 93 in the O’Neill Tunnel. Because the tunnels are underground and close to the ocean, they’re surrounded by brackish ground water that can seep in through any opening. Big Dig officials for years have downplayed the water problem, stressing that strategically placed pumps have largely succeeded in preventing the water from reaching highways used by 250,000 drivers a day. But Ernst, who has been the chief engineer of the Big Dig since 2007, said the damage from all the water is both widespread and by no means under control. In his report, Ernst said that the Transportation Department pumps out 17 million gallons of water per year, far more than Big Dig designers anticipated. As a result, the Big Dig consistently violates its state permit for the amount of water pumped to the Deer Island sewage treatment plant. Ernst wrote that the leaks are making the Big Dig less safe, especially in winter. “Leaks are the cause of numerous roadway icing conditions and accelerate corrosion by requiring deicing chemicals to be applied inside the tunnels,’’ he wrote, suggesting that road salt is partly to blame for the corroded light fixtures. Water also interferes with the ventilation system that carries vehicle exhaust out of the tunnel and fresh air in, Ernst said. In the winter, he said, the problem is particularly serious because water freezes inside the ducts, making it difficult to remove. Even when the water is cleared, Ernst said it has left behind unhealthy mold in utility rooms and ventilation buildings. He said the water has saturated the fireproofing materials that shield safety equipment and structural steel in the tunnels, causing $10 million in damage. Ernst said a design flaw in the Big Dig has made water problems worse: Concrete in the mile-long Interstate 90 connector tunnel was only designed to withstand a 50 degree swing in temperatures between summer and winter. But the actual temperature variation is 100 degrees, resulting in cracks that allow water to come into the tunnels. Ernst said that all the water damage will be expensive to repair, listing $136 million in leak repair and prevention efforts that the agency has completed or is considering. That amount includes the $15.2 million a year transportation now spends on sealing leaks and inspecting the tunnels. He gave no estimate of the cost of repairing all the cracks in the concrete of the connector tunnel. But Ernst’s report was revised considerably after he forwarded the document to headquarters and DePaola asked staff to shorten it. The condensed version did not include Ernst’s enumeration of costs, mentioning only the $3.2 million price tag of annual inspections and $12 million in annual leak control work. Ernst’s report had mentioned some form of the word “leak’’ 34 times; the new report uses the word leaks just once, instead using “infiltration’’ or “infiltrated water’’ to describe the problem. The revised report mentions most of the same issues as Ernst’s, but with less urgency and less detailed analysis. For instance, the revised report acknowledges the need for “deep excavation’’ to repair tunnel cracks, but omits Ernst’s conclusion that the cracks are exacerbated by “failure of design’’ - using concrete that couldn’t withstand the temperature variations in this region. By the time DePaola briefed the board about Ernst’s findings on July 13 - the same day that Mullan put Ernst on a 10-day unpaid leave - the sense of urgency from Ernst’s original report seemed lost. The analogy is literally true - three garden hoses running all year would yield a comparable amount of water. But, as Ernst’s report underscores, the issue isn’t the sheer volume of water but the effect it has on a tunnel of this design. And the garden hose analogy works to dilute any sense of alarm. DePaola insists that his briefing was not meant to contradict Ernst’s internal report, explaining that he may make a broader presentation on the damage caused by water once a consulting engineer’s report comes in. For now, DePaola said his agency will invest $45 million in leak plugging over the next three years and perhaps a lot more, depending on what the consultants recommend.